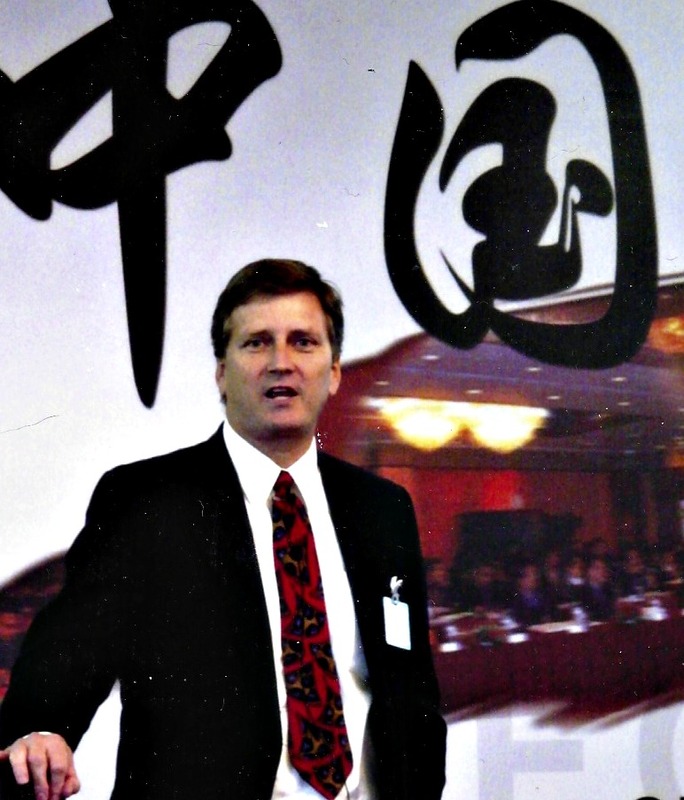 During his two decades of experience with sales reps, he’s also seen all the tricks designed to get past gatekeepers. So don’t bother calling after 5 p.m., sending him half a gift (the other half to be delivered when he meets with you), or anything else. However, Sattler does make time for value-adding discussions with his vendor partners. For starters, they act like real partners, investing time to learn how his business operates and his key priorities. They don’t open up a conversation with lame questions like: “What keeps you up at night?” Instead, they bring new ideas to the table that will support key business priorities like growth in new markets, accelerating product innovation, or improving overall profitability. The key issue, then, is how does one earn the right to be a vendor partner? Sattler told me that they build credibility within his organization and cultivate relationships with his current strategic suppliers. Oh, and it doesn’t hurt to be honest about your capabilities and limitations. These will come out sooner or later. Unfortunately, Sattler estimated that less than 5% of reps have the necessary skills. So, phone calls and emails go straight to the trash, while favored suppliers get the valuable time everyone seems to want. Those sobering remarks came early in Forrester’s recent Sales Enablement conference, held March 3-4 in sunny Scottsdale, Arizona. Principal Analyst Scott Santucci opened up the proceedings with another splash of cold water in the face. A new Forrester study found companies are getting a -79% return on the portion of Sales and Marketing investments targeted to grow revenue. Forrester calls this Growth Return On Selling System or G.R.O.S.S. And the results really were gross (sorry), based on the companies Forrester studied. Although results vary somewhat by industry, the overall picture is bleak. If CEOs get wind of this, they might just decide to stop throwing good money after bad and cut the budget. All that cost savings would go straight to the bottom line. All activities that are performed by employees in your company to generate revenue. A selling system cuts across organizational silos and is not limited to the sales organization. It includes the collection of all people involved (even if only a portion of their duties are involved), the technology used, the resources consumed, activities performed, services contracted, or external expenditures made with a focus on the goal of generating revenue. In my article about Revenue Performance Management (RPM), I concluded that it would take CEO leadership, Marketing and Sales collaboration, and a collaborative culture to increase revenue productivity. Santucci makes a similar argument for a Selling System. In 2012 for my article about B2B buyer experience management, my research found most B2B sales and marketing professionals agreeing that understanding the buyer experience was important, yet precious view had any clue about it. That article referenced a Forrester study which concluded: “The traits in a salesperson that executives find valuable and strategic, namely focusing on solving a problem (13%) and on driving an end result for them (8%), were the least common traits perceived by buyers. 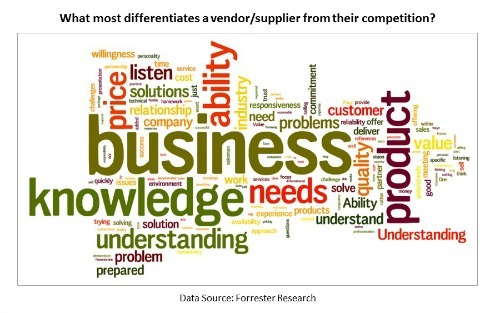 In this word cloud you’ll see what today’s buyers consider to be key differentiators, including knowledge of their business, listening skills, responsiveness, and flexibility. Sadly, the situation has not improved. Forrester’s 2013 update found no real progress in the three years since the last study. There is still a “significant gap” between what buyers want and what they get. That’s unfortunate, because studies by McKinsey and the Corporate Executive Board both concluded that the quality of sales experiences (as buyers perceive them) was a key driver of revenue growth. Forrester’s research found about about 45% of buyers are like CIO Sattler: they want sellers to focus on an end result and solve key business problem. What they get, all too often, are reps that deliver slide decks instead of conversations, lead with products and not industry insights, and waste time in meetings because material hasn’t been customized for the buyer. Where to Start? Here’s a Radical Idea: The Customer! Despite billions of dollars spent on software and training, sales performance is not improving. CSO Insights’ 2013 “Sales Performance Optimization” study found just 31% of companies meeting or exceeding their revenue plan. Unsurprisingly, only 58% of reps made quota. The fix? 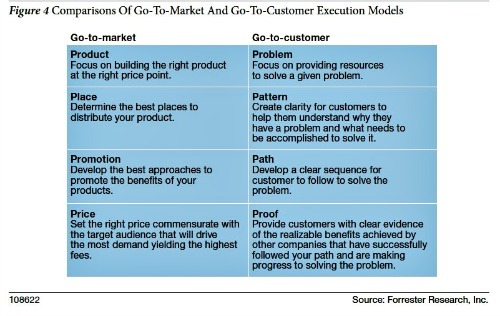 Forrester’s recommends a shift in approach from product-pushing “go-to-market” thinking to “go-to-customer.” That’s a deceptively simple but hugely important distinction. 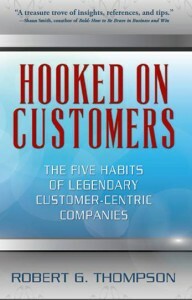 In my research I find many companies are delusional about their state of customer focus. If a product or service has some potential connection with a prospect’s problem, they declare themselves customer-centric while continuing to push product messages. Buyers like Sattler simply tune this out. Still, for simple, commodity-like solutions, a product-based approach can work. If customers want a widget, sell them a widget. Well-honed marketing and sales processes can make this effective without the effort required to dig deeper to uncover real customer needs and desires. Simple, right? Message > Messenger > Customer. What’s different is driving this process with what customers care about. The conference featured several excellent cases that show this “customer first” approach is not just a dream. My favorite was Motorola Solutions, a big provider of first responder mobile solutions to government. According to SVP Eduardo Conrado, company leaders decided to take a step back and develop a customer-oriented mission of “helping people be their best in the moments that matter,” rather than more of the usual technical blah blah blah. Conrado says they are progressing well on their journey from a product provider to a solutions provider, with the goal of being a trusted advisor to their customers. A deeper understanding of their customers drove development of new marketing creative, along with tools to help reps find and use the right content based on the customer, situation and sales stage. He said the most popular and useful assets were “point of view” white boards, solution briefs, and presentations that covered industry trends and customer issues. In other words, marketing and sales content that speaks to customers, not products. What a refreshing change. Of course, Motorola still sells products, and sometimes a more tactical approach is appropriate, says Conrado. To put it differently, you can’t always “challenge” your customer to think bigger and more strategically. But it’s worth questioning whether you’re selling tactically because of the customer’s priorities, or your own limitations. This personalized approach to marketing and sales execution, driven by customer insight, is the core big idea behind Forrester’s Selling System framework. While the concept is simple, execution is anything but. 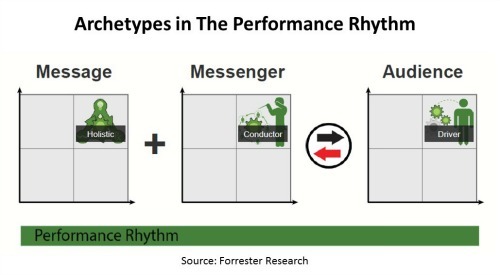 Companies need to understand buyer “archetypes” (conceptually similar to personas but can represent buying teams) and then develop and align the messages and messengers into “Relationship Rhythms.” The four default rhythms — Responsive, Accommodative, Prescriptive, and Performance –- must be aligned with the right types of buyers. Here’s an example of a Performance Rhythm that fits the Motorola story previously mentioned. As you can see, this alignment requires that a “holistic” message be delivered by a “conductor” messenger to a “driver” buyer archetype. Analyst Norbert Kriebel was careful to say that these labels are not cast in stone. Each company needs to do the work required to create an appropriate set of rhythms. All of the foregoing is quite a departure from what most people think of as “sales enablement.” In conversations with conference attendees, vendors and industry colleagues the past few weeks, I’ve concluded that sales enablement is basically anything not already called CRM, SFA or Marketing Automation. Content management, training, playbooks, mobile devices, … the list goes on. Personally, I prefer the term “sales empowerment” because the idea is to help reps be more effective. Don’t just enable them, empower them with the knowledge, training and tools to help them engage more effectively and have better conversations with their prospects. CallidusCloud has grown a lot from its beginnings in incentive management, now offering sales content management along with marketing automation and more. Qvidian is probably best know for sales playbooks, which they say helps reps close bigger deals. Savo Group offers a CRM Opportunity Pro solution to deliver content, tools and selling tips to sales reps from within Salesforce.com. Skura advocates a “mobile first” strategy, which helps reps get more face time with customers and help them buy. Wittyparrot concentrates on helping reps access and reuse the right content on any device. Much like the evolution of CRM and marketing automation, dozens of vendors and consulting/training firms are chasing the sales enablement opportunity. This is just tiny fraction of SE solution providers (see a more comprehensive list here). I think it’s about time. Since the beginning of the CRM craze, I’ve argued that more companies should invest in improving sales effectiveness in the field. Now it’s finally happening. Major CRM vendors are paying attention, and I expect many SE software solutions will ultimately became part of CRM or MA suites. Being the customer-centric guy that I am, I really admire the thinking behind the Forrester Selling System. But some companies will no doubt balk at the change in orientation. It’s easier to just continue to blast content and send reps forth to pitch products. Quotas to be achieved and all that. Is the answer just to throw more training or tools at the problem? No, says Elay Cohen, former Salesforce.com executive, co-founder SalesHood, and author of a new book of the same name. The reality is that execution must happen on the front lines every day, with every buyer interactions, under the guidance of the first line sales manager. Based on his extensive experience leading sales enablement initiatives, which including using a vast array of tools, methodologies and training, Cohen found what really mattered. Sales managers must cultivate a collaborative, team-learning approach that will adapt the strategy and “playbooks” authored by HQ. Otherwise, sales reps won’t “own it” and institutionalize the right behaviors. This is exactly what I’ve found more broadly in my research on customer-centric success. Leaders figure out how to create and sustain the right set of “habits” — routine behaviors engrained into the culture — to execute the company strategy. Forrester’s Selling System is clearly much more than just a new coat of paint on old selling ideas. It requires a major shift in thinking, strategy, and field execution. That sort of change can only be driven by the CEO and other senior business leaders, but must supported “on the ground” by first line sales managers and their teams. Thanks to Scott Santucci of Forrester for inviting me to attend an outstanding conference. And for leading the charge to advocate a customer-centric approach to improving B2B marketing and sales. Disclosure: Forrester provided a complimentary pass for me to attend this conference. This article is part on my independent coverage of industry developments. No endorsement is implied for any companies mentioned. Some vendors have been CustomerThink sponsors within the past year. Please visit our sponsor page for information on companies that have supported the CustomerThink community.